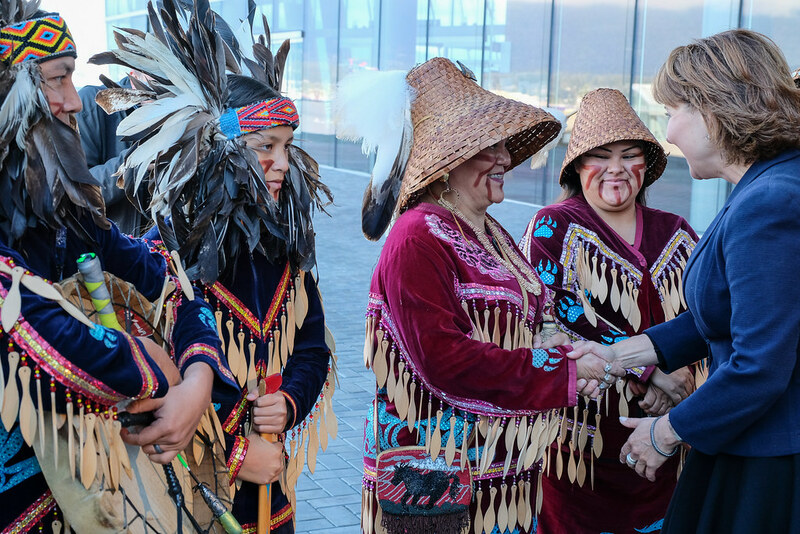 This week, I spent three days at the Vancouver Convention Centre making photos during the First Nations Leaders’ Gathering. As you can see from the Government Flickr album, this is standard conference fare. Not a lot of art, just a lot of visual documentation of speakers and meetings, sprinkled lightly with a few candid shots. The candids are definitely my favourite shots from any of these events. Think street photography with a telephoto lens. Speaking of ”street” photography, I find that spending time as an observational documentarian on the street is one of the best ways to sharpen event shooting skills. Of course, when I’m on the street, the focal length is somewhere between 14mm to 35mm, not 50mm to 140mm. But the mindset is the same. I’m looking for great light, human interaction and dark shadows. Included here are two outtakes illustrating what most people seem to be doing during the conference, hustling to the next meeting or waiting. Given that I walked nearly six kilometres each day, I was more in the hustling camp. They also illustrate the great light on that side of the conference centre, where I shot many of my candids. “Hustling” and “waiting” captured with the Fujifilm X-Pro 2 and the XF16-55mm f/2.8 lens. I also used a pre-production X-T2 and the XF50-140mm f/2.8 lens during the three days. Hustling (a lot) posted on Don Craig on September 10, 2016 3:45 am . See the FIRST IMAGES of the Fujifilm XF 23mmF2, XF 50mmF2 and XF 80mmF2.8 OIS Lenses!